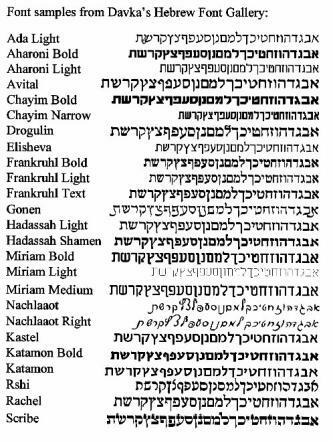 Nowhere else will you find a Hebrew font selection value like this! The Hebrew Font Gallery consists of 25 of the best Hebrew typefaces, designed to integrate with Mac and Windows applications (not compatible with Dagesh or Hebrew Windows). These Hebrew fonts will add flavor and distinction to all of your documents, whether you are composing a Bar Mitzvah invitation, editing a synagogue newsletter, or creating an ad journal for a Jewish organization. These fonts come in both TrueType and Type 1 formats (Windows fonts available in TrueType only), and are compatible with a wide variety of popular products, such as Quark Xpress, PageMaker, Corel Draw, Publisher, Word, FreeHand, Illustrator, and more, on both Macintosh and Windows platforms. The Macintosh fonts are even compatible with Nisus! These fonts come in a wide variety of styles. Some are designed for headlines, some for text, some for special purposes, but all share the same high quality. Since they are all on CD-ROM, you no longer have to fumble to look for that misplaced font. They are all easily accessible right out of the box! Apple MAC Yes Macintosh Hebrew word processors, such as Nisus. The fonts on this page, when used in English applications, require typing from left to right and do not include Hebrew vowels. P&P will be charged at "light/heavy items" rates (1/2/3 or 3/6) - click here for full Postage & Delivery Details including shipping rates within the UK, Europe and worldwide, same day and next day before midday options. Any questions prior to ordering? - then email: Sales or call us on 0870 766 3699, otherwise proceed to the Order Form.